Take a look at the two trees below. Do you think they live within the same ecosystem? Unfortunately this is a trick question. 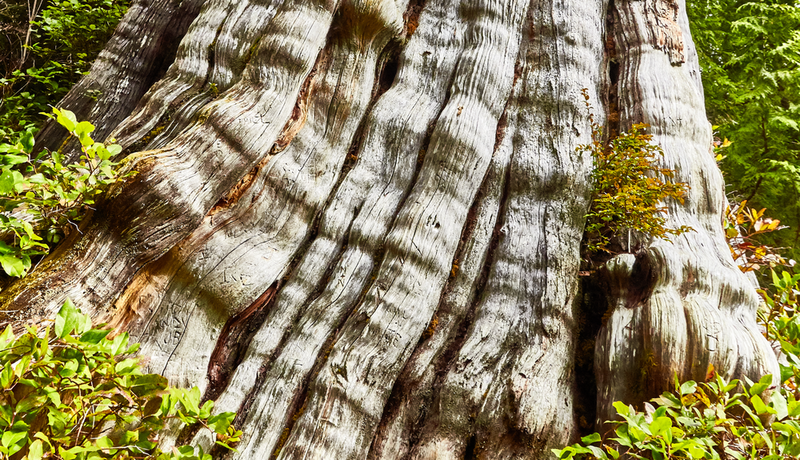 These photos show the south- and north-facing sides of the same tree which according to a nearby sign is the world’s largest Western Redcedar. My family and I recently visited this tree on the Olympic Peninsula, winding our way across graveled forest service roads through vast swaths of clear cut forestlands to stand at its feet in awe. With the protective forest of trees within which this ancient being thrived cut and hauled away, exposure to the sun has completely desiccated one side of its body rendering it bark-free and bleached white while the “back” side, protected by its own bulk, retains some moisture leaving it slightly more green and vibrant. Can you imagine what this tree might have looked like before the forest around it was cut down? This tree is bigger than it looks in this photo shot with a wide-angle lens. Having had a moment to commune with this being I am certainly grateful that the people responsible for desecrating this forest left this ancient one to stand. However, while this tree is still alive it is clear that its continued existence hangs by some small but invisible thread. No intact, living, lifeblood-delivering strips of bark are evident, and only a few small tufts of scale-like leaves remain at the very top of the tree. From one point of view this Redcedar is just an individual being, but from another it exists as an integral component within many successive rings comprising much larger ecological systems and beings. It cannot flourish by itself. It will not thrive alone—no forest tree can. Humans, just like this Redcedar, do not flourish in isolation. Nor do we exist apart from nature, but most of us who have been raised in Western culture have been conditioned to think and feel this way. In fact the very way we in techno-industrial society use the words nature and environment implies separation. Human culture is here. Nature and the environment are somewhere over there. Nature and culture don’t overlap. It is well documented that the language we use shapes the way we perceive the world. Habitually speaking about nature and the environment as spaces apart from where we live reinforces our sense of separateness, but if we find ways to become more consciously attuned with ecological intelligence we might experience it otherwise. Rather than as a backdrop for our human activities, we may come to experience nature as a shared arena within which all beings find ways to struggle, support, and harmoniously coexist, but if we regularly navigate the world using cultural maps that distort the actual terrain, where do we end up? Cutting ourselves off from the guidance of ecological intelligence allows us to adopt mindsets that think we can save the biggest tree while cutting down the forest or preserve select parts of this thing we call nature. We are incessantly urged forward, blind to the surrounding terrain, by the unconscious beat of a human-centric marching tune. At some point along these paths toward inevitable futures these blinders may fall off leaving us to look about in horror to see that the rivers have been polluted, the forests have been razed, the oceans filled with plastic, and the planetary systems that sustain life no longer function like they used to. At the same time we come to realize that we are not well. Our physical health is failing. Our children are killing themselves at unprecedented rates. We are depressed and increasingly addicted to pharmaceutical drugs that stop us from feeling pain and sorrow. I sometimes write or speak of Wild Nature by which I refer to the concept of nature that hasn’t been domesticated by modern Western thought, but Wild Nature is not somewhere out there. For me Wild Nature is synonymous with God or the Universe. It is everywhere and always accessible. The word nature which shares an etymological root with nativity literally means that which gives birth. If you’ve been present to a birth you would probably, like me, want to celebrate the mother who gave birth as much as you would celebrate the life that emerged, but in the same way that appreciation for the care mothers provide is often marginalized, we have disregarded the interconnected webs of care Mother Nature bestows upon us as children of her Earth. Plants promote these processes of re-humanization, reminding us that we are integral parts of the ecosystems we inhabit and helping us become integrated members of the Earth community. In fact if we allow our nervous systems to interact with the chemistry of plants that we consciously ingest, learn to align ourselves with the archetypal energies they embody, and allow ourselves to harmoniously reorganize through those interactions on a regular basis, we cannot help but become better humans and citizens of this planet. We can also engage in these plant-inspired processes energetically and imaginally. Imagine now that you are sitting in an intact forest filled with ancient Redcedars. Lichens hang low swaying in the same gentle breeze that shakes water droplets from the leaves of the trees. As nets of mycelium transmute fallen logs into soil the rich scent of the moist forest floor wafts through the air. Breathe this oxygen-rich air deeply into your lungs. As you exhale allow yourself to attune to the cycles of animal-plant respiration as carbon dioxide transforms into oxygen and vice versa. Continuing to breathe deeply notice that the air entering your body contains more than just its measurable physical components. It also contains transmissions of Redcedar’s ecological intelligence. Allow this intelligence to inform your presence within the world. Feel your roots sinking deep into the earth. Feel your spine straighten as your body lengthens to connect with the sky above, your body becoming a conduit, energy cycling through your being from deep within the core of the Earth and from the Sun, the Moon, and beyond. Notice the subtle but strong vibration that moves through and permeates your body and energetic being. How does your body respond as it accommodates this pulsing information? What is Redcedar trying to teach you? 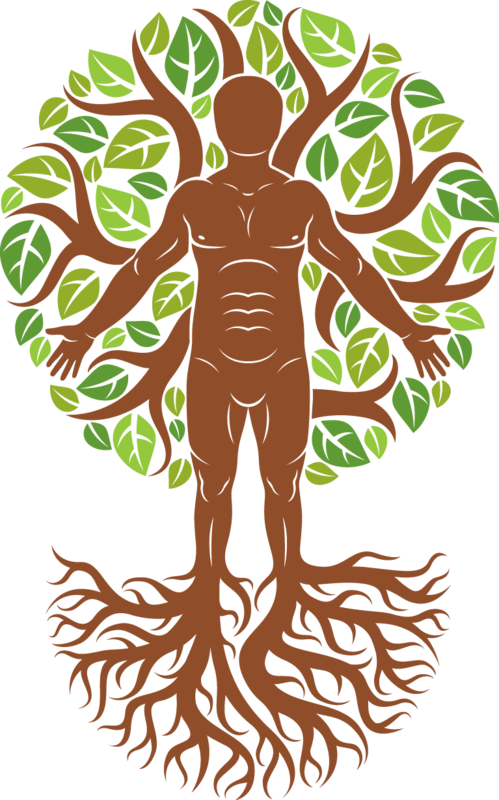 Paradoxically allowing the intelligence of plants and the more than human world to inhabit our bodies makes us more human. It helps us better understand what it means to be of this living Earth. Engaging in processes of re-humanization dissolves our sense of separateness and helps us remember that we are part of the interconnected energetic and physical systems of the land and ecosystems within which we live. Remember we don’t have to go someplace else to experience this. Nature and its ecological intelligence are available here and now, always and everywhere. When you say things like “I just spent some time out in nature” or “I feel so much more alive when I’m out in nature,” take a moment to consider the conceptual space you are perpetuating, the thought field you are inhabiting. From this perspective how would you describe your relationship to nature? And how would you describe it after sitting with these Redcedar trees and breathing with them? Or in recognizing that the air, food, and water you’ve ingested today is circulating through your home and body as part of much larger systems that generate and perpetuate life? In a sense we are culturally living in a clear cut forest just like the world’s largest Western Redcedar. And like this ancient being our lives seemingly hang by a small invisible thread. I’ll invite you now to try the exercise presented above. Instead of imagining that you are sitting in an intact forest, rest your body against the massive trunk of your life-clinging Redcedar kin as it stands alone in its degraded forest home. What does it have to teach you about being a human on Earth during this time of great change?